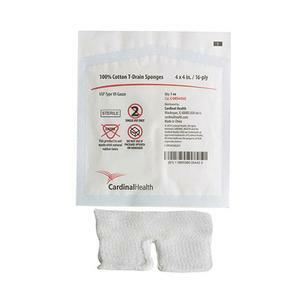 Cardinal Health™ 100% Cotton Drain Sponge, USP Type VII 4" x 4", 16-ply, Sterile 1s - Bi Medical Distributors Inc. This Gauze Sponge helps keep tube sites clean and protected. It is pre-slit to allow for a snug fit and is designed to lay flat around a drainage tube. It is available in non-acute only. • Ideal for IVs, drains, tubes, catheters and tracheotomies.